About two weeks ago, I started a series on economic diversification for us to understand the factors responsible for Nigeria’s economic structure. Today, we would be looking at one of the major problems facing resource dependent economies like Nigeria and which also undermines efforts at economic diversification – the natural resource curse. 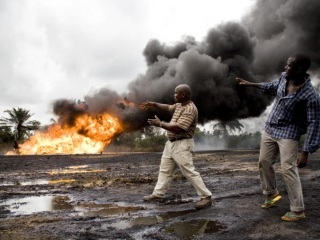 Oil was discovered in Nigeria at Oloibri in the Niger delta in 1956. But prior to that Nigeria was a net exporter of certain agricultural produce like cocoa, palm oil etc. but once oil receipts started coming in, the production of these goods started to diminish. So how and why did this happen? Did our leaders just become lazy due to the influx of oil revenue? Well, that’s part of the explanation, I mean when you literally have oil deposited in your land that can be extracted and will earn thousands of dollars, that is much more higher than what you would earn exporting any agricultural produce, why exactly should anyone bother about tilling the ground and exporting agricultural products? I mean doing all of the dirty hardwork, what incentive is there really?! But the problem is much more structural, you see countries that discover natural resources automatically become exposed to the resource curse. One of the major consequences of the resource curse is known as the ‘Dutch disease’. ‘Dutch disease is an economics term that refers to the negative consequences arising from large increases in the value of a country’s currency. It is primarily associated with a natural resource discovery but can result from any large influx of foreign currency into a country, including foreign direct investment, foreign aid or a substantial increase in natural resource prices’. So basically, here is how it works. when a country starts exporting oil or any natural resource for that matter, the value of the country’s currency appreciates due to demand for the commodity. What this means is that let’s say prior to the discovery of oil, the exchange rate was $1/N100, with the discovery of oil, it appreciates to $1/N50, the implication of this, is that with $1 you are now only able to purchase fewer units of a given commodity.Now people/countries may be willing to pay more money for oil because it is a scarce natural resource which is a necessity but what this also means is that other goods like agricultural produce which Nigeria exports will now become more expensive to purchase. For example, if a basket of cocoa used to cost N100 prior to the discovery of oil when the exchange rate was $1/N100, someone purchasing it from abroad would only have to pay $1 for a basket of Cocoa. However, if the currency appreciates after the discovery of oil and the exchange rate becomes $1/N50, the person purchasing a basket of Cocoa from abroad would now have to pay $2. So basically, resource discovery makes non-oil exports more expensive. But the problem here is unlike oil, there are tons of other countries which manufacture cocoa, so if the price of Nigeria’s cocoa becomes more expensive, they simply go to another producer. Thus with the appreciation of the exchange rate and its effect on the the price of Cocoa therefore, Nigeria’s Cocoa becomes less competitive abroad. This explains why countries like Nigeria have found it difficult to diversify their exports but rather have been dependent on the export of a single commodity. But that is not the only effect the dutch disease has on economic development. Resource-dependent countries typically do not generate sufficient jobs as resource exploitation is more capital expensive than it is labour expensive. I mean we can relate to this in Nigeria, before the recession, when oil prices were within the $100 – $120 mark and our growth rate was around 6% p.a, unemployment and poverty rates were increasing. In addition to this, resource dependence also undermines democratic accountability as it breaks the social contract between the government and their people. In ideal societies, the arrangement is usually that the people allow themselves to be taxed with the expectation that the government will provide them with governance and public goods and services in return. But in the presence of natural resources the government can afford to let go off tax revenue because of the huge revenue they get from oil exports, so they do not necessarily feel obliged to fulfil their mandates because they know they do not depend on citizens for income. In addition to this, it also weakens fiscal discipline as the dependence on oil revenue makes such countries less likely to strengthen tax systems. To put this in context, at 6%, Nigeria has one of the lowest tax/GDP ratios on the continent. Natural resources reduces the incentives for governments to reform broken tax systems, broaden their tax base and ensure compliance as the government is not as dependence on tax revenue as oil revenue. Finally, it increases economic vulnerability and instability as resource dependent countries usually experience boom-bust cycle. When oil prices are high, such governments engage in tons of projects, most of which are white-elephant while failing to save for the rainy day and then once oil prices falls, the economy goes into a crisis or even a recession like we are currently experiencing. So that’s how best I can explain the natural resource curse, let me know if I missed anything guys, would be interesting to know what you all think. Next week, we shall be looking to find out if the natural resource curse is a trap, I would like to know if countries can get out of it and if so, how? Finally, if you have any specific questions, comments etc. kindly indicate in the comment section..cheers! Previous Nigeria’s exchange rate falls below N400/$1 for the first time since August 2016, what could possibly be wrong with this? I just came across this blog, and I find it very educating and interesting. Thumbs up.